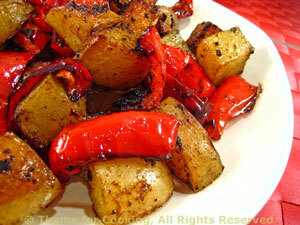 Grilled Potatoes with Red Pepper and Cumin, Thyme for Cooking side dish. Cumin, paprika and sherry vinegar add a hint of Spain to these grilled potatoes. Use any color pepper you like - and add hot peppers if so inclined. Slice the pepper into thick slices. Put spices, vinegar, olive oil into a large bowl, add potatoes, peppers, and toss well to coat. Cook over medium heat 20 - 30 minutes, until they all have a nice color and potatoes are done. Serve.